Donations and grants from individuals, foundations, business corporations, government, and crown corporations contribute to the Wildlife Collision Prevention Program annual budget, which is managed by the British Columbia Conservation Foundation (BCCF). BCCF is registered in Canada as a not-for-profit organization (#123042822RR0001). Dale, Matheson, Carr-Hilton Chartered Accountants, of Surrey, B.C., audit BCCF accounts annually. For information on personal donations, click here. For information on corporate donations, click here. Many people have either had a collision with wildlife or have had a "near miss", and have an experience that they could share with others. The goal is to expand our knowledge of what happens, what drivers can do, and where dangerous stretches of road are located. To share your experiences go to the Contact Us page for mailing, faxing and email information. "I was driving during a very dark and stormy night about 15 km east of Burns Lake. I recognized that the obstructed headlights I was seeing were because a moose had crossed the road and blocked my view of the oncoming headlights. If I hadn't put the brakes on immediately because I had a feeling that there was something out there ... it would have been game over for me. I was really lucky because there was very little between me and the moose except for the windshield of the passenger van that I was driving." Suggested lesson: Always watch for obstructed or flickering headlights or tail lights on vehicles ahead of you - that could mean that an animal is on the road in front of you." "I had three deer hit our two vehicles. Two deer hit the car, and one hit the truck. That was 3 1/2 years ago, then I got wise and removed our deer whistles. We still drive the same roads and see lots of deer. They could be grazing right along the road and they just pick up their heads then go right back to grazing and we have had nothing even close in all that time. I will never have deer whistles on my equipment any more. I live in the Cariboo near 100 Mile House, BC." "I have a moose collision story. In fact, I'm lucky to be alive. In July of 2004, I struck a moose just outside the city limits in Prince George, BC. It was just west of town on a stretch of highway dotted with moose signage. Daylight was quickly fading and vision was made even more difficult by the number of headlights approaching from the opposite direction. Despite the amount of traffic, I struck a moose, which sailed overhead and landed behind my car. The damage: a minor abrasion on my forehead from the windshield, and seven stitches from a piece of broken plastic on the visor. I bit down on my tongue, which was badly swollen the next morning, but I didn't even had a headache. Earlier that year, a man traveling in the other direction, not far from where my incident occurred, was killed when his vehicle struck a moose. His car was smaller than mine, which was a Delta 88 Oldsmobile." "I hit a moose at night approximately 10:30 pm. The moose came out of the ditch beside the road and because there were some bushes along this road I did not see this moose until it was too late. I was driving an older type Ford ranger single cab, an ‘89’ I think, anyway I hit the brakes and tried to swerve into the other lane but only got so far as thinking about turning the wheel when I struck the animal. It went up and over the hood of the truck and rolled into the windshield and for a couple of seconds all I saw was brown fur. I remember thinking I hope it doesn’t roll onto the cab. Sadly the moose was badly hurt from this accident and expired shortly after. I had blown both the brake lines on my vehicle and severely cracked up the windshield. This vehicle was a standard. Just above the steering wheel was a small section of the windshield that was not starred or fractured that I was able to see out of. I drove home hunched over the steering wheel so that I could see out of this little portion of the windshield still intact, and gearing down to first gear to slow down the truck. Suffice it to say I was able to make the 40 kilometer journey back to my house and arrive there a few hours later than I had planned." "Deer whistles have, in my opinion, kept me safe in peak months on BC roads for at least eight years, particularly as I have used them as a regular item on the front of my vehicle while commonly driving around anywhere from 10-30 deer at a time; sometimes right in the ditch beside me, even at nighttime. I strongly believe there has been a correlation between my accident-free driving record (as well as the preservation of wildlife) and these deer whistles, and I have not yet purchased an expensive model or necessarily the "best" model." This contributor suggests that deer whistles do work, but there is no independent scientific documentation to support this. Suggested lesson: Don't rely exclusively on deer whistles - always drive Wildlife Aware. WCPP is looking for images of wildlife vehicle collisions for use on this website and in other public awareness publications. If you have an image that shows your vehicle after a collision, or the rescue vehicles that came to assist you, or of the animal that involved in the collision, please consider sending it to us. License plates and other identifiers would be removed prior to website posting. Hard copies of photographs would be digitally scanned and returned to you. What happened? Where were you? What were the road conditions? What was the condition of the right of way or the ditch - treed, grassy, wet? Did you see one or many animals? Your story would be posted on this website, but there would be no identifying information posted. To share your stories go to the Contact Us page for mailing, faxing and email information. "At around 8 pm a 2 year old or so deer jumped up from the side of the road - totally out of nowhere! I had been driving 4 hours from Kelowna to Grand Forks and hadn't seen one deer. I swerved slightly but kept control and just put on the brakes. We collided almost instantly. I was very upset, it was a blur! I would not get out of my vehicle. Thankfully my husband and brother were in the vehicle and some other motorists stopped by the road. They said the deer had died instantly. My vehicle has a lot of damage but no humans were hurt at least. As an animal lover and vegetarian, I was very sad that this poor creature had died. I wish there was some way to deter these beautiful animals from the highway. There must be a way - either a fence or tunnel, something that will make them not want or need to cross the road. We should feel privileged to share the land with them, and protect them. I know this costs money. But life is more important than a price tag. Also, when this happened I realized that I had NO IDEA what to do if I was in a wildlife accident. Call the Police? Call the Wildlife Conservation Officer? Did somebody care and want to count this victim in statistics? Drivers should be made very aware of what to do in this situation." Call the RCMP if there is damage over $1000 or any human injuries. Call the Conservation Officer Service if there is a dead or injured animal to report. In BC, call 1.877.952.7277. In AB, call 1.800 642.3800. In a National Park, contact the Park Wardens. Reporting the exact location of collisions helps wardens monitor injured animals and recover dead ones. Quick removal prevents other animals from being attracted to the highway. The Highways maintenance contractors responsible for that particular stretch of highway are contractually obligated to remove the carcass, record its location and other details, and report monthly to the Ministry of Transportation on the number of carcasses they remove. "I witnessed a collision with a bear on the highway in Bonnington, near Nelson BC in full daylight. This was almost more related to multiple cars tailgating than speed. The bear was able to time it and cross between my vehicle and the car in front of me. Traffic going the other direction suddenly confused him, there were 4 cars taking up the same amount of road space. He hesitated, jogged to an opening and got hit. Fortunately he bounced, rolled and got up again and was able to make it to the other side once traffic had cleared." "I just saw the most horrible sight in my life (or very close to it). On the way home from Nelson (around 5:15) I was following 2 other trucks going a nice proper speed. As we came to a bend, the first truck started around the curve and then started to slow down quite precipitously. As the truck in front of me went around it too slowed down. So I slowed down even before the curve thinking either an accident or a road crew leaving for the day. It was about dusk but you could still see without the aid of headlights. As I came around the bend I saw what was slowing us down - 2 young white tail deer trying to find a way off the highway. Lakeside - concrete abutments; opposite side - a face of rock. So we followed them for a few hundred feet as they swerved back and forth. They must have been frantic. At that moment, I think all 3 drivers saw a truck coming around a bend ahead of us, in our direction, with lots of room to slow down. The first truck in our group flashed his headlights, but the truck kept coming. I flashed my headlights, but the truck kept coming. THERE WAS NO WAY HE COULD NOT HAVE SEEN THE DEER!!!!! He didn't brake, he didn't slow down. He just drove over them and kept going!!!!!! When we jumped out of our vehicles, the fellow driving the first truck said, "Did you see that, he made no effort to avoid them!!!" The guys pulled the 2 dead deer to the side of the road - they were killed instantly thank heavens. I cannot believe that someone would intentionally kill an animal for no reason. There was plenty of warning and opportunity. No excuse. No hesitation after hitting them - just motored on. I will calm down - someday. I am appalled." 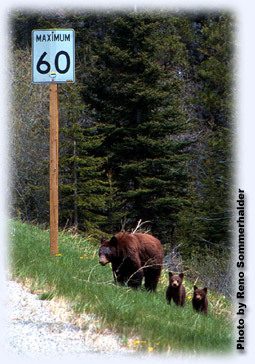 Do you see animals frequently on the same stretch of road? Where is it? What time of the year is it most common to see animals? "In British Columbia, there is a very dangerous section of road along Highway 97 south of Penticton to Okanagan Falls, around Skaha Lake and back up to Penticton along Eastside Road. From about May to September (and sometimes in October) I usually see 35+ roadkilled deer." This web site is operated by the British Columbia Conservation Foundation (BCCF) for the benefit of our members and those interested in supporting our organization and its causes. It is free for use by individual web users. No registration is required. The privacy of our users is important to us. BCCF does not collect any personal information about users, except that which is knowingly and specifically supplied to us by the user. We will not disclose any personal information about users to any outside parties unless the user was advised of this possibility before providing the personal information.